I’ll have to admit, when I heard about Parents’ Day, which is today, I thought it was just another chance for greeting card companies to make some more money! But, up on further reflection, I was actually quite excited about what Parents’ Day COULD be if the right perspective is applied to it. The Hubby and I have always held to the understanding that parenting is a team sport. There is no “mom’s side” and “dad’s side.” We function best, parent best, love best, teach best, and model best when we do it all as a team. This team is more important than any other we will play for in this world. The work we do together as parents has generational and eternal consequences. I want to encourage you to take this holiday today to celebrate your teamwork and make a new commitment in areas you haven’t been heading in the same direction. * Plan a celebratory date night. But don’t make this just any date night – make it a night to celebrate how far you’ve come in your parenting journey together and make a plan for moving forward! Talk about some parenting goals, areas to grow, how to fill in each other’s gaps, anything in the parenting arena that will spur you on! * Have the kids pray over you and your role as their parents. It may seem a little awkward to ask the kids to do something for you for Parents’ Day, but this could become a very powerful annual tradition. You may need to guide them a little depending on age and their comfort level with praying out loud, but that makes it a great teaching opportunity as well! You could tell them some areas you need prayer for as their parents – patience, forgiveness, guidance – or just let them pray! * Look at birth pictures with the children. Our kids love seeing pictures of when they were babies and we love talking about when they entered our family. This is a great way to refocus in a difficult time as well – it’s hard to not be grateful for my role as a parent when looking at those precious little bundles! It also reminds me how short my time is to parent them at home! * Pray together for unity and guidance. Ecclesiastes 4:12 is most often applied to marriages, but pray it over your parenting as well. We need each other and HIM to keep on in this parenting journey. We will be attacked on all sides, but having each other and God’s guidance will make all the difference. And if you’re a single parent, make sure you celebrate YOU! You deserve another day to celebrate the love and work you are pouring into raising your children. Take a moment to also thank those who have come alongside you as a parent, whether it is helping you out in some way or being a positive influence in your children’s lives. While you’re at it, make sure you celebrate your parents and any people who have mentored you as a parent as well, with a phone call, prayer, hug, or yes, even a card! 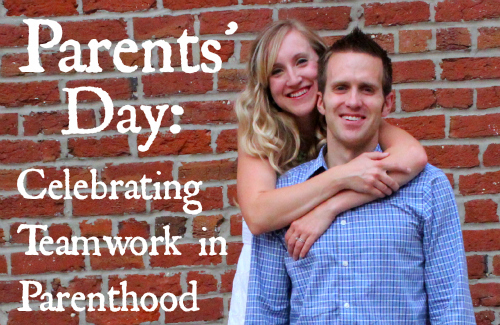 What will you do today to celebrate Parents’ Day? Leave a comment below. We’d love to hear from you!